If one or more of the following statements applies to you, Patsy is sure she can help you progress beyond your expectations! "I don't know how to get started." "I need help choosing the right materials." "My colours look dull and flat." "I can't make my paintings look 3 dimensional." "I can't capture a "likeness" in portraits." "I don't know how to create good composition." "How do you paint texture?"" "I can't draw a straight line." Other drawing and painting difficulties also catered for! Patsy believes the secret of successful drawing and painting lies in "seeing what you are looking at" and using your eyes more than your brain. Your own personal "style" should be encouraged, based upon clear understanding of form, colour mixing, drawing and painting technique etc. You may be a complete beginner in either drawing or painting, or may be having difficulty with particular techniques. Whichever your situation, these classes are tailored to your own individual needs and you can work at a pace at which you feel comfortable. As their title suggests, these classes comprise individual one-to-one tuition, with an emphasis on specific subjects that appeal to you, be they landscape, seascape, still life, flowers, portraiture and more. They will, however, be restricted to drawing or watercolour painting. For beginners, drawing and/or painting materials will be provided on the first session, during which we can discuss useful equipment to buy. Beyond this stage, students are requested to bring their own materials. 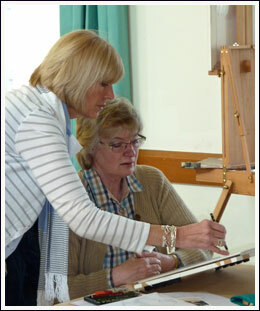 An easel, drawing board, paper, pencils, graphite and water pot will be available for use. For your first session, you will be asked, where applicable, to bring along some previous work, in order to assess style, standard, areas of interest and personal challenges. Please note that there is no set duration for a course of classes. You may wish to attend for just one session to address a particular technique or "problem area", or you may prefer a series of classes, during which we can track your progress and improvement. The choice is yours. Come prepared to make progress and surprise yourself with the speed of your improvement!